Most people have heard of Fibonacci Numbers but Lucas Numbers are not so well known, which is rather strange as Edouard Lucas was the first to give the name Fibonacci to that particular sequence of numbers. There are many different Lucas sequences. The numbers used here are generally referred to as the Lucas Numbers. 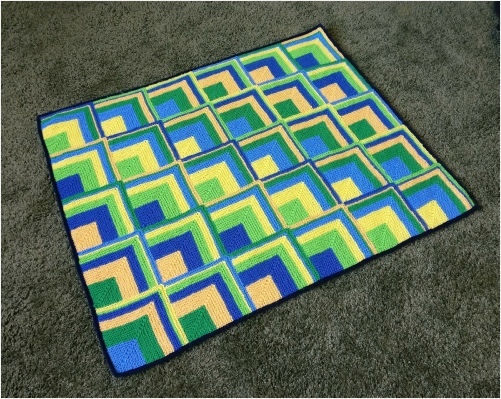 There are 30 mitred squares in the baby size blanket. Each square is constructed by picking up stitches from previous squares. It is worked in one piece but the maximum number of stitches on the needles, at any time, is 56. 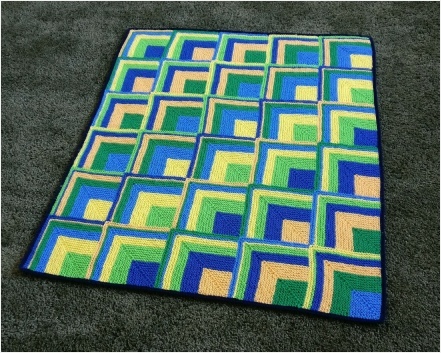 The overall size of the afghan can be changed by adding more squares until you get the size you want. 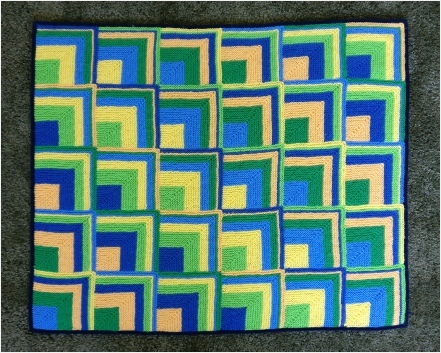 The pattern includes several variations, using more colours and different arrangements of squares. There is also a version using a much larger square. Most people are familiar with Fibonacci numbers but Lucas numbers are much less well known. They are very similar. The terms Fibonacci Numbers and Fibonacci Sequence did not exist until François Édouard Anatole Lucas (1842–91) came along and was working with number sequences. He wanted to give a name to the ‘rabbit’ sequence, which was first described in 1202, by Leonardo of Pisa. Leonardo never called himself Fibonacci. His father was named Guglielmo Bonaccio so it is possible that the derivation could be son of Bonaccio. At that time there was confusion in the language because scholars were using spoken Italian but writing in Latin. Fibonacci was perhaps first used, as a nickname, in 1838. It is often forgotten that Fibonacci was also known for other mathematics and was one of the first people to bring to Europe the Hindu-Arabic number system that we use today. The Fibonacci numbers begin 0, 1, 1, 2, 3, 5 … where each term is the result of adding together the previous two terms. There are other ways to start a series where the terms quickly turn into those in the Fibonacci series. 1 and 0, 1 and 1, 1 and 2, are the simplest. The order of the numbers cannot be changed. This afghan produces its interesting effects by keeping the numbers consistent but rotating the colours used to represent those numbers. In practical terms, for craftwork, Lucas numbers are much more useful than Fibonacci numbers, mainly because when using Fibonacci numbers the zero at the start usually has to be ignored because it cannot be represented. It is also tricky to start anything with 1 (row, say) followed by another 1. It is much easier to start with 2. The terminology is a bit confusing because Lucas Sequences refers to many series of numbers and the Lucas Numbers and Fibonacci Numbers are just two of them.